Issue 29 | March 2018 | It's important to have a twinkle in your wrinkle. 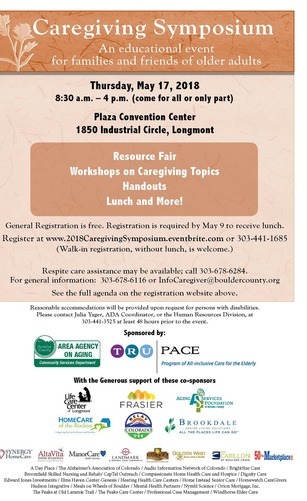 A Must-attend event for Caregivers: Register Today! Registration is now open for the annual Caregiving Symposium. The event features a large resource fair, 16 workshops on caregiving topics, complementary lunch, and much more. Register online today. Financial assistance for respite care may be available; call 303-678-6284 to learn more. When: Thursday, May 17, 8:30 a.m.-4 p.m.
BCAAA has been invited to participate in a managed care panel at this year’s Aging in America conference, hosted by the Aging Society of America in San Francisco. Alongside Jewish Family Services of Los Angeles and Whistlestop, BCAAA will be presenting on our partnership building work with healthcare payers and providers. If you would like to learn more about our healthcare integration work, contact Jacob. Boulder County's Local Coordinating Council (LCC) is a collaborative of local agencies working together to provide accessible, affordable, and equitable transportation options, while raising awareness that transportation is a basic social and economic need. BCAAA staff regularly contribute to this collaborative, keeping the transportation needs of older adults a key part of the group's conversations. The LLC created this Transportation Testimonials Video that demonstrates the importance of transportation to older adults, people with disabilities and low-income families. Want more information on the LCC? Visit their webpage. Nearly 300 people joined us last week for our inaugural nutrition conference, Everybody's Table. 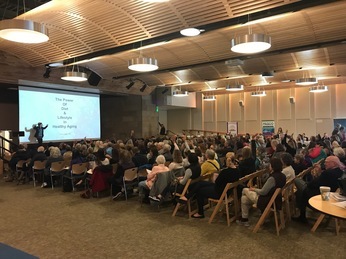 Attendees accessed nutrition resources, demonstrations, and counseling and were treated to a rousing presentation on diet and healthy aging by local expert, Dr. Coco Dughi. We were also able to offer live translation via personal headsets, allowing about a dozen Spanish-speaking older adults the chance to participate as well! Many thanks to the countless community partners who made this event such a success. Want more information on nutrition resources in Boulder County? Visit our website. Starting next month, the US government will begin issuing new Medicare cards for all Medicare beneficiaries. The new cards will no longer feature beneficiaries’ social security numbers; instead, a new 11-digit number will be used. Read more about the new cards here. Are you passionate about building a more age-friendly community? Do you enjoy helping organizations thrive? 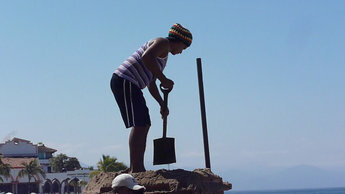 Are you looking for ways to give back to your community? If so, consider joining the board of the Aging Services Foundation! Learn more here. The National Family Caregiver Training Program is a series of classes designed to equip family caregivers with the practical skills need to provide safe home care for an older loved one. Learn to take vitals, manage medications, lift and transfer, and more. When: Tuesdays, April 3-May 8, 1:30-4:30 p.m.
For more information or to register, call Juliette at 303-678-6284, or visit our website. Please join us in welcoming Michael Chifalo, our new LGBT Program Specialist. Michael was born and raised in Pueblo, and has worked for a variety of supportive service programs including domestic violence survivors and post adoption services. He currently works at University of Denver’s Graduate School of Social Work teaching research, policy and practice. Michael brings a wealth of knowledge and enthusiasm to our LGBT programs and we look forward to working together to provide support for our LGBT community and providers. Click here to learn more about our LGBT Programs. The Boulder Public Library will host “Portraits of Ability: Stories of Independence and Inspiration” through mid-June at the main branch on Arapahoe Ave. This exhibit features 15 “portrait-stories” of people served by Via Mobility Services who are not defined by their disability or age. You can read more information on these portrait-stories online. Do You Qualify for the Senior Homestead Property Tax Exemption? 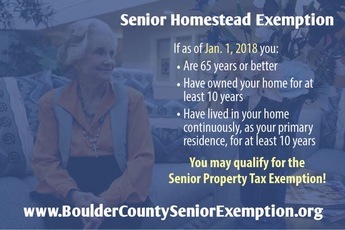 If you are 65 or older and have lived in your Boulder County home for the last 10 consecutive years, you could qualify for a reduction in your property tax payment. Visit this site to learn more and watch a short informational video about the program. You can also call the Assessor's Office at 303-441-3530. If you think you are eligible for the program, you must sign up before July 15 in order for it to be considered on the next year's tax bill. Did You See Our Recent Facebook Post about how to protect your back?